February job gains came in at a whopping 313,000 new jobs, so much that NBC Nightly News anchor Lester Holt acknowledged it “blows away economists’ expectations.” The Wall Street Journal said expectations were at only 205,000. Unemployment also remained at the 17-year-low of 4.1 percent. But only one network gave the good news any serious attention. In spite of a jobs report that U.S. News & World Report said was the “single best month since mid-2016,” both NBC’s Nightly News and ABC’s World News Tonight failed to do a full story on the jobs situation. Those shows chose to include fairly short anchor reads of the numbers, spending 15 seconds (Nightly News) and 24 seconds (World News Tonight) respectively. The coverage of both was dwarfed by CBS’s reporting on Evening News March 9. That Evening News report was more than four times as long as coverage on ABC’s World News Tonight, and more than seven times as long as NBC’s Nightly News. Anchor Jeff Glor introduced that 111 second report by noting that Wall Street gave the jobs report a “thumbs up” — the Dow had rallied more than 440 points that day. The positive economic story by national correspondent Jim Axelrod included financial contributor Mellody Hobson. ABC’s World News Tonight remains dead last of the three network evening shows covering employment. It had the least amount of Friday jobs coverage between Feb. 3, 2017, (the January 2017 jobs report) and the March 9, 2018 BLS release of February 2018 jobs. 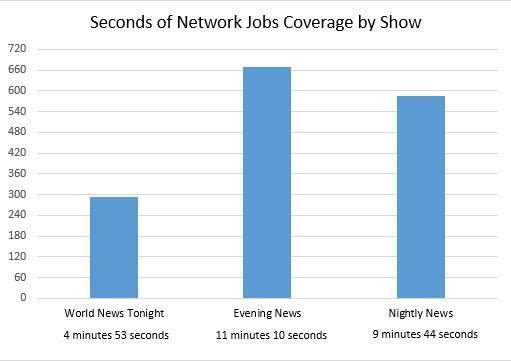 World News Tonight spent just 4 minutes and 53 seconds combined on jobs those nights. NBC’s Nightly News spent almost twice that with 9 minutes and 44 seconds, while CBS’ Evening News devoted the most time to the subject those nights with 11 minutes 10 seconds of reporting. Methodology: MRC Business has been tracking the amount of time spent on jobs or employment news on the Friday of each month that the Commerce Department’s Bureau of Labor Statistics announces the latest data. This time tally only reflects the ABC, CBS and NBC evening news broadcasts on those specific nights. 1. What type of media bias is highlighted in the post? 2. Why should the networks have spent significant time this story? Why is the jobs report newsworthy? 1. The post illustrates bias by story selection and omission. 2. It is newsworthy because the topic has been such a big story. If you read/watch news reports on the job President Trump is doing, stories imply that he is not successful. The jobs report is fantastic news for Americans. The media’s job is to report the whole story, not just the narrative they want it to be. The networks have a responsibility to inform viewers of important events. This is especially true for senior citizens – many of whom regularly watch NBC, ABC or CBS to get their news. If it is not reported on these news shows, they don’t hear about it.